Dominican males continue to under-perform and under-achieve- what have we done lately to stop the hemorrhaging? A few years ago, Garth Wilkin, a member of The University of the West Indies (UWI) Vice Chancellor's student ambassador corps, surprised dozens of secondary school students who gathered at the Dominica Open Campus, UWI for an open day with a rather blunt remark. He told the boys in plain language that they must "get off the weed" if they are to excel at tertiary education institutions and thus improve their chances at earning a good job. Wilkin then described a situation which has become so familiar that we have even begun taking it for granted. That is the growing trend in Caribbean society of disproportionate numbers of females who are attending school and earning diplomas and degrees while the males sit on the sidewalks getting high and receiving jail sentences. 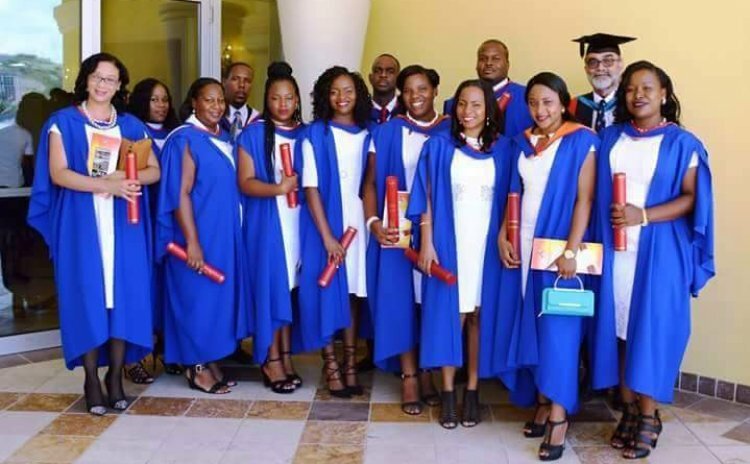 Social scientists call the situation male under-achievement and a UWI's economist, Mark Figueroa, fine-tuned the label by describing it as "differential gender achievement". But names hardly matter; the situation remains as grave whatever it is called. At The UWI Open Campus statistics show that male /female enrolment over the past five years (2010- 2015) were alarming- 80.9 percent female to 19.1% male; at Cave Hill in Barbados- 68.3 % female to 32.7 % male; at St Augustine in Trinidad- 80.9 female to 19.1 male; at Mona in Jamaica- 68.9 % female to 31.1% male. Closer home at the recent graduation ceremonies of the secondary and tertiary institutions the ratio of female to male graduates was also alarming although the number of males and females who enter secondary school after the Grade Six Examinations are about equal. Males begin dropping off the education radar in the early forms of secondary schools. What is causing the males of our society to drop out of the education system during, or after, secondary school? The answers to that question are many and varied and that could be one of the reasons why solving the problem of male under-achievement is so difficult. In fact some social scientists put the blame of that the disparity in educational achievements between males and females squarely on the shoulders of the education system. One of these is Peter Espeut, a Jamaican sociologist, who argues that the education system is highly skewed in favour of women and was established to keep down a particular class of men. Education has been feminized. Espeut suggests that one of the places to begin removing the gender bias in the education system is in the primary schools where the vast majority of teachers are female. If you want more proof that the education system has been absolutely feminized take a look at the pre-school system where almost all the teachers are female. Espeut also concludes that when we mix boys and girls in co-educational institutions we place the boys at a serious disadvantage because of the well- known fact that up to the age of 17, girls are much more psychologically developed than boys. Then there is the issue of how we raise boys in Dominican society. We give them the freedom to roam and even to "spread their wild oats" while the girls stay in to practice home management and beat books. In other words: tie the heifer and loose the bull. The impact of male under-achievement on the society is obvious. The Stock Farm prison is overflowing with males (figures like 250 males to two females are the usual count). And the while men continue to dominate certain areas such as politics, agriculture and engineering, it has become increasing obvious that females have made medicine, law and education their exclusive purview. Our court system have been flooded with young females over the past decades. This does not mean that women should be blamed for the exclusion of males from higher education. In fact the evidence shows that boys tend to assert their masculinity by resisting school. They believe the benefits of higher education takes too long to materialize; so drugs and the allure of quick cash seem to have won over our impatient males. The point is, given the highly competitive nature of the world today we cannot afford to let any section of our human resource go up in smoke or to disintegrate on the street corners. We have to find solutions to the problem of male under-achievement and we need to do that urgently. One of the solutions could be striving to put an end to the feminization of teaching, in whatever form it now manifests itself. More men are required in the classrooms of our schools and in addition we need to break down the stereotypes between male and female fields and subjects. Additionally government and the private sector must provide incentives to encourage the formation and preservation of families. It is not nearly enough to declare a "year of the family", as we did a few years ago, and then hope that that intractable problem of disintegrating families will go away. Of course the maintenance of the structure of families and the overall perception of the economic value of secondary and tertiary education depends heavily on the state of the economy. If the economy continues to stagnate, as it has been doing for decades, we may find that even females will begin to question the value of their effort at attending colleges and universities to earn diplomas and degrees. The point we hope to emphasize is that we have talked enough about the problem of male underachievement- we need to begin doing something about the degradation of that aspect of our human resource.